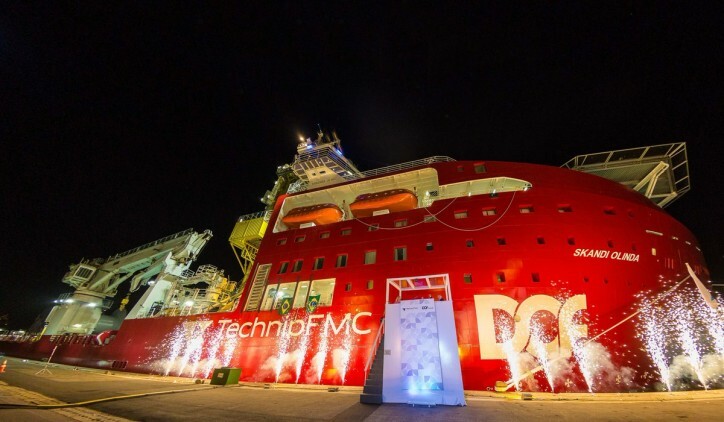 TechnipFMC (NYSE:FTI) (Paris:FTI) (ISIN:GB00BDSFG982) and DOF Subsea (DOF) announce that the Skandi Olinda, a Brazilian-flagged flexible lay and construction vessel owned by the joint venture formed between TechnipFMC (50%) and DOF (50%), has commenced its 8-year charter contract with Petróleo Brasileiro S.A. (Petrobras). Skandi Olinda has state-of-the-art pipelay and marine technology. She has a 340-ton Vertical Lay System tower capacity (Contracted capacity 300-ton), a 2,500-ton underdeck carousel, and two work-class ROVs, allowing her to lay flexible pipes in water depths up to 2,500 meters. She was built by Vard Promar Brazilian yard, where her sister ship, Skandi Recife, was also constructed. Under the TechnipFMC/DOF joint venture agreement, TechnipFMC will manage flexible pipelay, and DOF will be responsible for marine operations. Arnaud Piéton, President Subsea at TechnipFMC, commented: "We are delighted that the Skandi Olinda is joining our fleet of specialized vessels. This new charter contract with Petrobras reinforces our commitment to the development of the Brazilian market and our extensive ultra-deepwater pipe-laying experience. We are looking forward to seeing the vessel delivering projects in the field."